On my previous braiding/french plaiting post here, I was asked for a lesson in fishtail plaiting. This is everywhere at the moment, and such a pretty and effective look for summer. I know I'm late in doing this - had to wait for a suitable candidate with long enough hair - thanks to Vicki for being my model. So I'd thought I'd show you how to do it and you can adapt it to how you want to wear it. There are no rules - make your own. I love wearing it on the front of my hair, or scruffily pinned up. Ok to start, the basics of the fishtail are simple. Two ponytails, entwined into one braid. As with the french plait, once you start and see the pattern emerging it's easier. If you have mid length hair it's not going to look like a big fishtail trailing down, but it can still look pretty. I would suggest if you hair is layered to add a band at the top to secure the ponytail before 'fishtailing' lot easier to do. You can always cut this once you are done and pin to hold it. Just gives you a helping hand. So I swept Vicki's hair over to one side (vice versa if you have a side fringe or parting, parting on right, sweep to left) and pinned the hair (loosely is key, anything too structured won't look right) to hold. Then divided into two ponytails. Taking a small section of hair from the outside of the left ponytail, I crossed over the top of the left ponytail and joined it to the right ponytail. I repeated this step on the right ponytail, and did this alternately to create the fishtail. Once finished I secured with a clear elastic band. Then I began to tease the fishtail to give a messy undone look. If you want a big fishtail and don't have the hair, get yourself a hairpiece. Aslong as it matches your natural colour you'll be fine. Hope this little tutorial helps. I've been wondering whether to start a youtube channel for some tutorial videos as it's a lot easier to give advice that way. Would you guys watch? and will you be giving this a go? And don't forget my giveaway, link to the left of my blog. Along with the COSMO Blog awards, would be super smashing great if you fancied nominating me. p.s A massive thanks for Crystal for taking the photos. Thanks so much for this, Kel! I saw it on a TV show but I couldn't get the hang of the instructions. I'm going to be practicing all weekend in readiness for Big Chill hair next week. I'd love a YouTube tutorial. Yay, thanks Kel! There was a tutorial in Heat a while ago but I utterly failed at following the instructions. Yours seem much more coherent so I shall try it out over the weekend. If you do give it a go, let me know. Would love the see if I help. 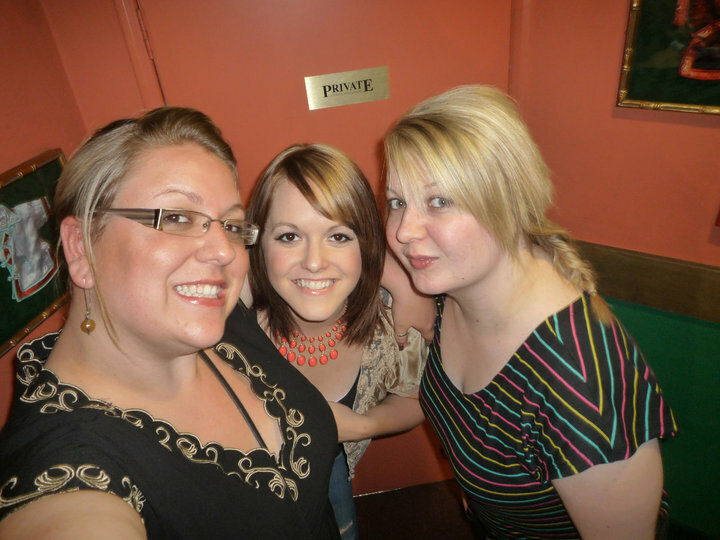 p.s Vix, that's my sister Crystal, her friend Vicki, and me. We had chopsticks in our mouths 'walrus' style so no takers. HAHA!